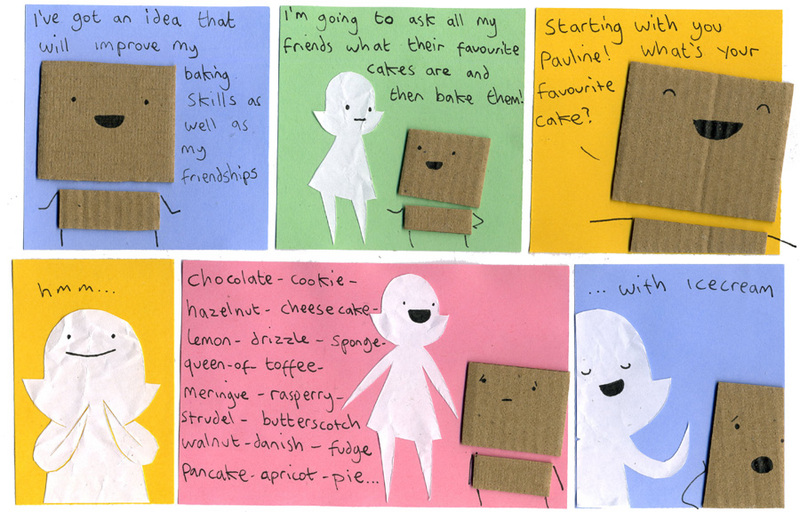 What’s your favourite cake? Maybe I’ll bake one for you. If your favourite cake is chocolate lion’s head cake, you might be interested to know that I already baked of those last weekend. Here’s a photo that proves it. Well, Philippa, that Lion’s Head cake looks like the most awesome type of food ever created. I don’t know if I’d be able to eat such a work of art. Holy moly that cake is adorable! Oh I think a muffin can count as a cake! An excellent choice. Your cake is fantastic and terrifying at the same time. Care to share you recipe? Yellow cake with chocolate frosting. Simple and awesome. my favorite cake like food is sticky toffee pudding. sadly black treacle is hard to find in the usa. I just love cakes that have a ton of chocolate stuff in them and on them. yum! How did you know Lion’s Head is my favorite !? But to be honest, I LOVE cheesecake ! I like chocolate cake! I am surprised that nobody has said that yet! Give me your recipe! It includes Flake, right? Yes Flake. 15 Flakes in fact. I made Cherry Coke French Vanilla cake and it’s sooo good! All you need is a can of whatever soda you like and a box of whatever cake mix you like. and you use the instructions on the box (ignoring the other ingredients it calls for). It’s subtle but soooooooo good! I guess the carbonation is what raises the cake… it’s fantastic! i like square cakes! oh and blackforest! square cakes come with designs of a chess board or gift box type of cake! ive seen a pic of them and tried to make em to! i kept screwing the fondant! maybe change the fondant to marzipan or icing? hmm LOVE THE LION CAKE! that lion cake looks awesome! I am all about the Ice cream cake but it has to be the kind with the little crunchies in the middle or else its just ice cream. How about some Vanilla Crazy Cake!? now that’s a classy cake! Red velvet cupcakes made from scratch with vanilla cream cheese frosting. Ohmnomnom. There is a huge cake baking boom here in the Finnish internet circles, thanks to one blogger, “caramel cat” whose website I linked here. Her cakes are pure art AND she has time to photoshoot the steps! Great help for others and just as a hobby. <3 Sorry, texts only in Finnish – but pics are of course always multilingual. IIII like strawberry cake with cream cheese icing! =d Yum! And that lion head cake is AWESOOOME! Geez, Pauline, ice cream is just too much! That lion’s head cake is so cute! My mom makes a coconut cake in the shape of a bunny face! What is Flake? i´m Pauline! I love all cakes … with ice cream! Chocolate Lion’s Head sounds like a recipe from Cardboard Carl’s cookbook. and your lion head cake .. so fun..
you should enter, seeing as you’re a wealth of talent! That’s gonna be a BIG cake!